ST. GEORGE – No. 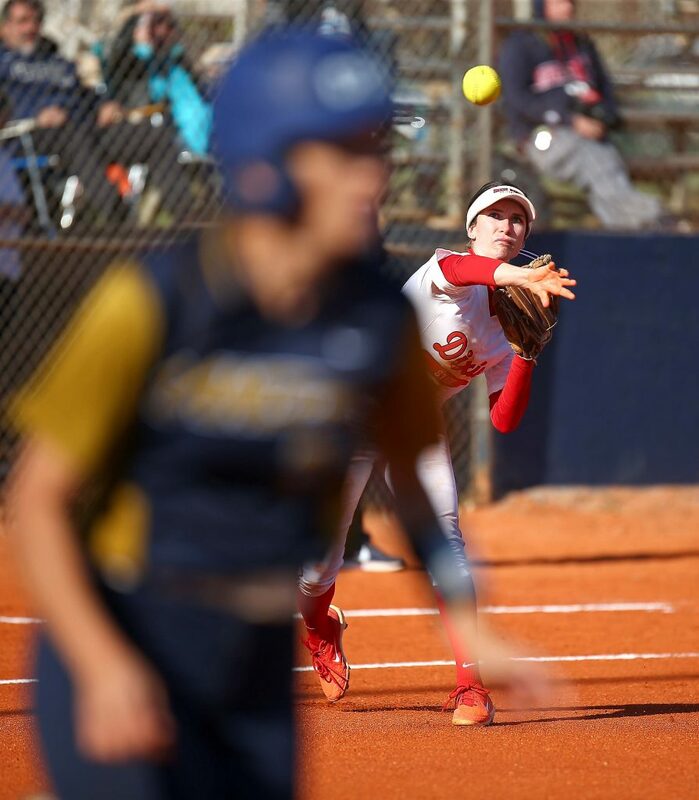 6 Dixie State softball split a Pacific West Conference doubleheader with No. 14 California Baptist on Friday, 4-3 and 7-3, at Karl Brooks Field. 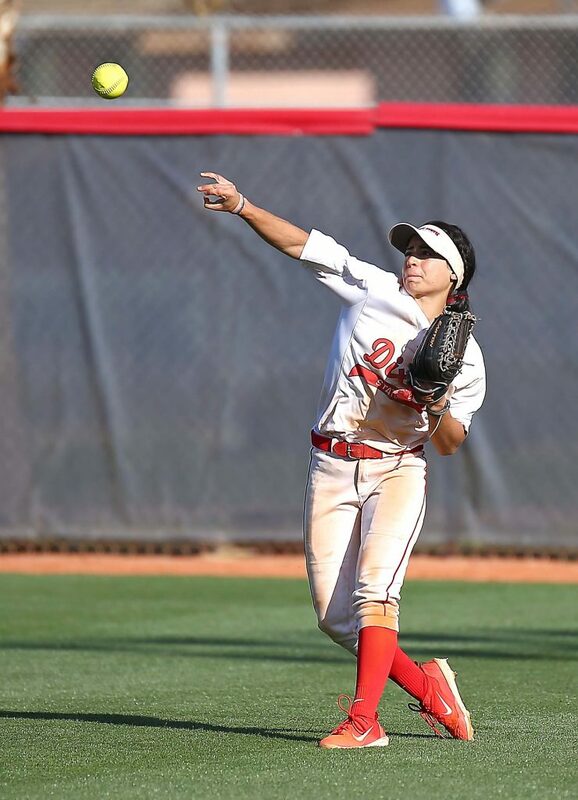 The Trailblazers (33-5, 17-5 PacWest) built a three-run lead and held on for a 4-3 win in the opener, but struggled to pick up hits in game two and fell, 7-3. In gaining the split, the Lancers still hold onto a two-game lead atop the PacWest Conference as the season winds down. The two teams square off again Saturday. 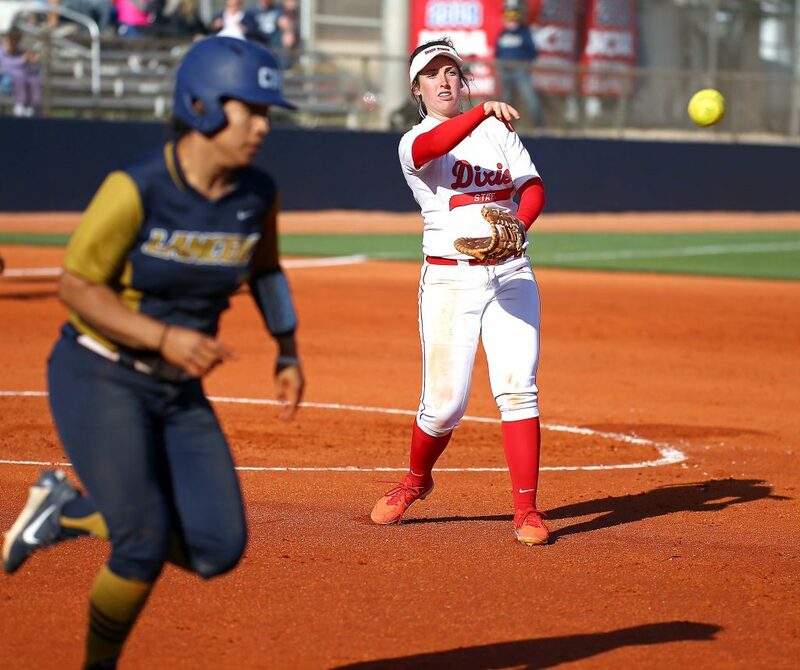 A sweep by DSU would put the teams in a dead-even tie, while a sweep by CBU Saturday would just about wrap up the regular-season title. Saturday’s doubleheader starts at noon. California Baptist threatened to take an early lead in game one, putting runners on the corners with just one out in the top of the first. 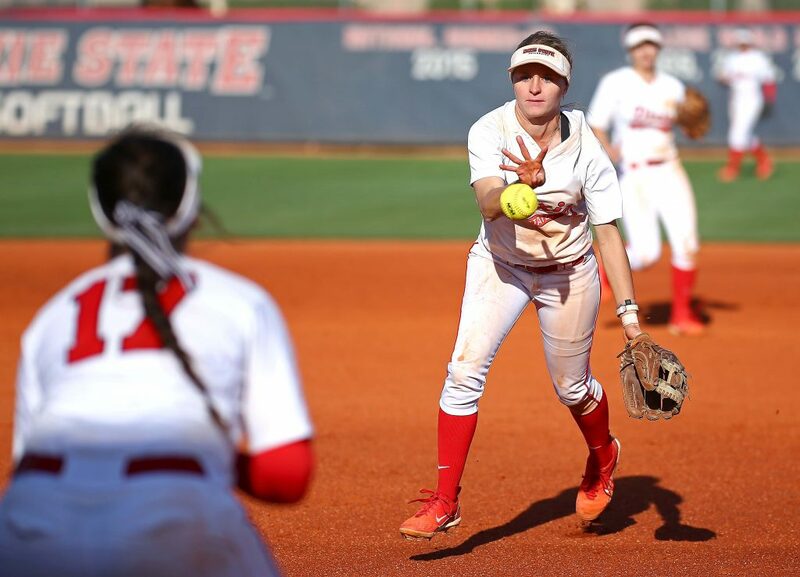 However, DSU forced back-to-back popups to Bailey Gaffin at shortstop to escape the jam. 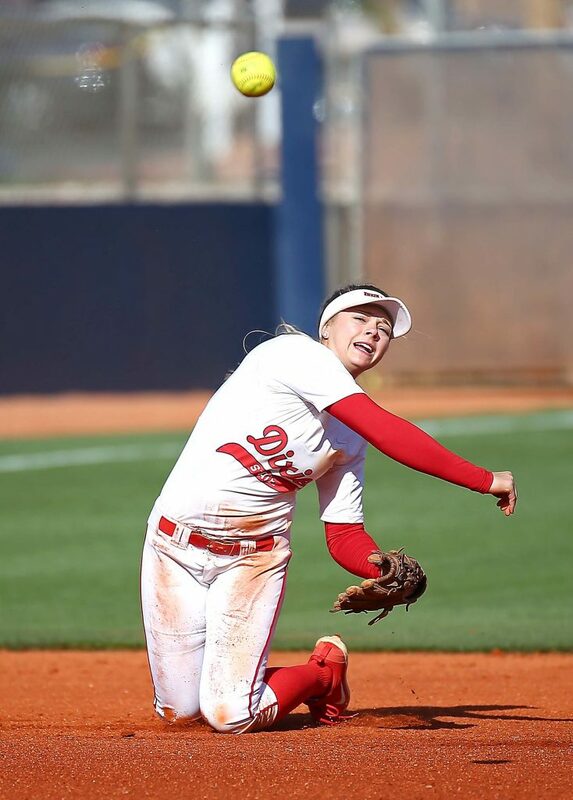 Dixie State took advantage in the bottom of the first, scoring two runs on two hits and one CBU error. Janessa Bassett opened the frame with an infield single, stole second, and advanced to third on a Brenna Hinck sacrifice bunt. Bassett scored on the next play on a Kenzie Sawyer RBI-groundout. After drawing a walk, Gaffin scored later in the inning on a Jessica Gonzalez RBI-single to build a 2-0 lead. The Lancers cut the lead in half in the top of the second, plating an unearned run with an RBI-single to pull to within 2-1. The Trailblazers countered with two more runs in the bottom of the second. 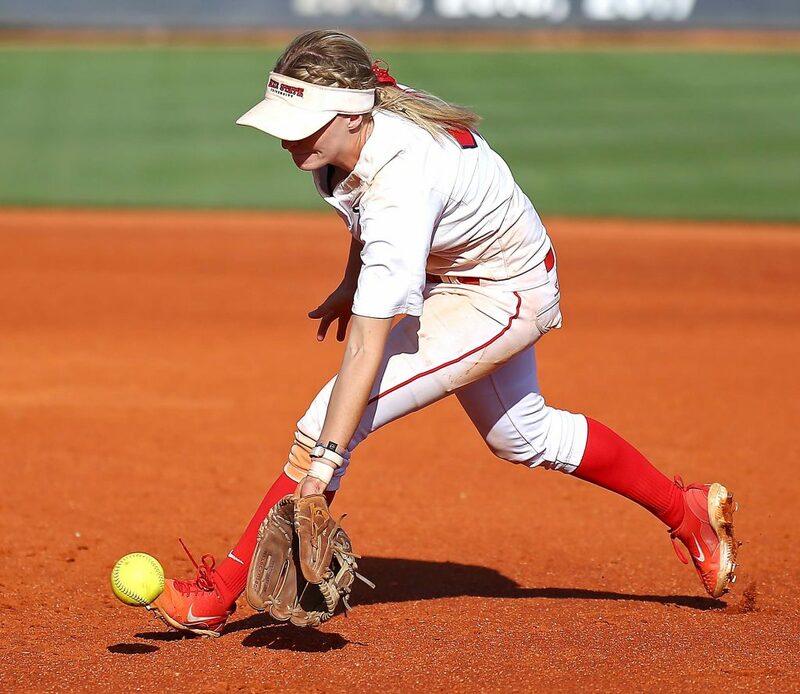 Dani Bartholf scored the first run from second, moving to third on interference by the CBU shortstop, then scoring on a Lancer throwing error to the plate. Kaitlyn Delange later scored when Hinck singled through the right to push the lead to 4-1. CBU answered with a solo home run in both the third and the sixth inning to pull to within 4-3, but it wouldn’t be enough. After a leadoff single for the Lancers in the top of the seventh, the Trailblazers retired the next three batters to seal the victory. 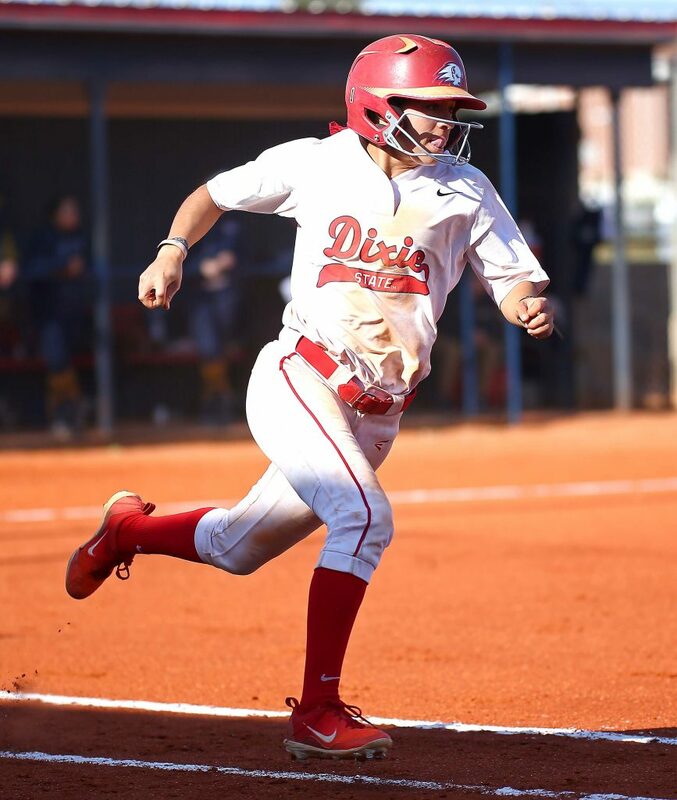 Delange and Gonzalez picked up two hits each to lead DSU at the plate, while Cambrie Hazel (15-2) earned the win in the pitcher’s circle to match the most wins (Lauren Folta, 2009; 15-6) in a single season by a DSU freshman. Alexandria Melendez picked up her first career save after entering the game with one out in the top of the sixth. The Lancers took their turn to build an early lead in game two, scoring four runs on four hits in the top of the second to take a 4-0 lead. 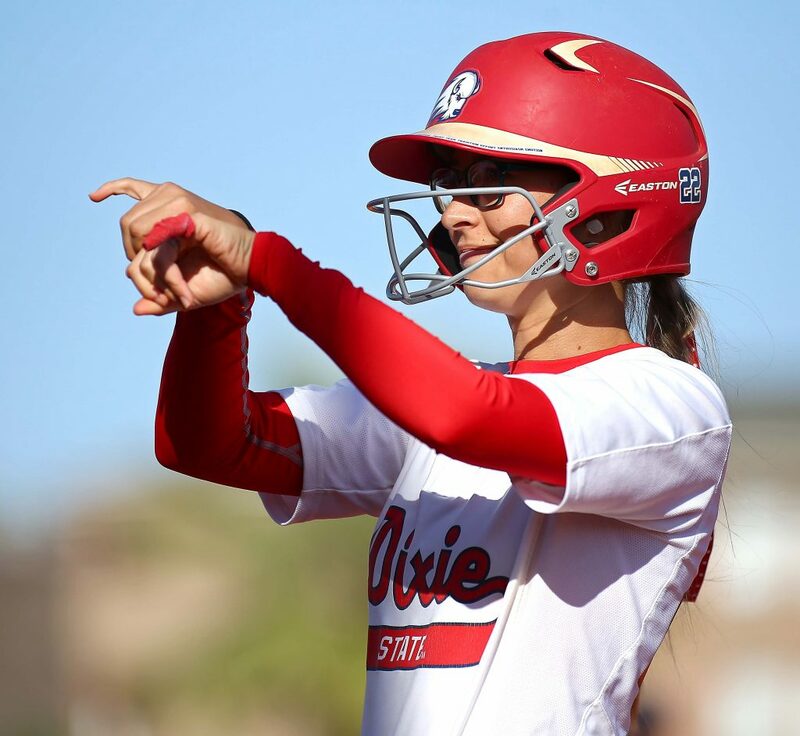 Dixie State pulled one run back in the bottom half of the frame when Bartholf blasted her second home run of the season over the center field fence to pull to within 4-1. But the Trailblazers would get no closer than three runs the rest of the way. 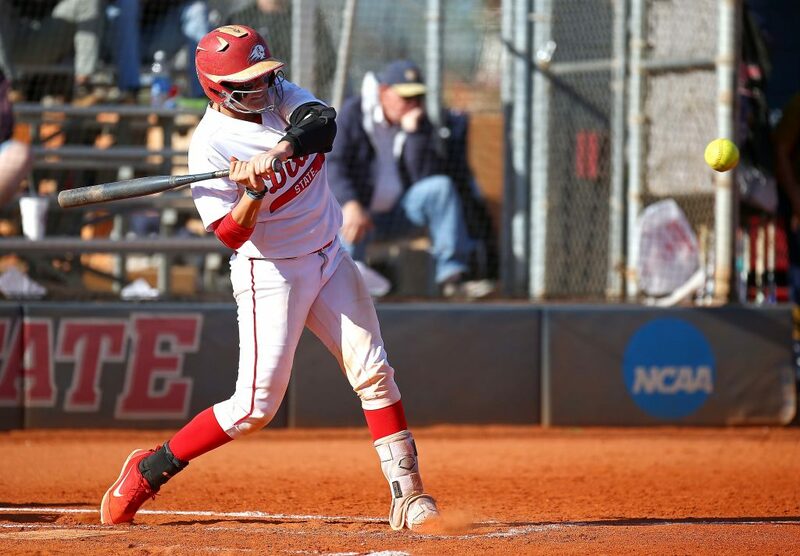 The Lancers scored two runs in the fifth inning and one run in the sixth inning to extend the lead to 7-1. 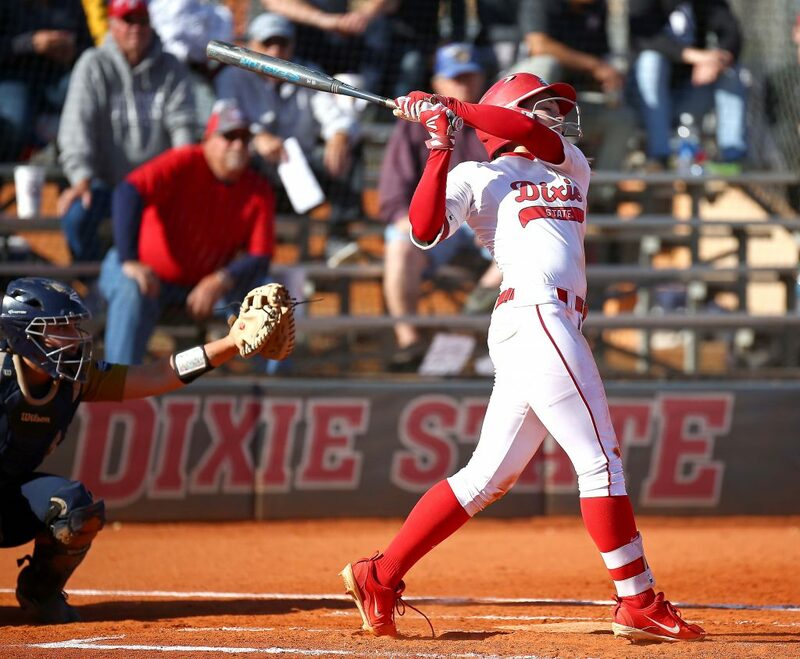 DSU put together a small rally in the bottom of the seventh, scoring two runs on three hits. Kori Gahn opened the frame with a double to left field. 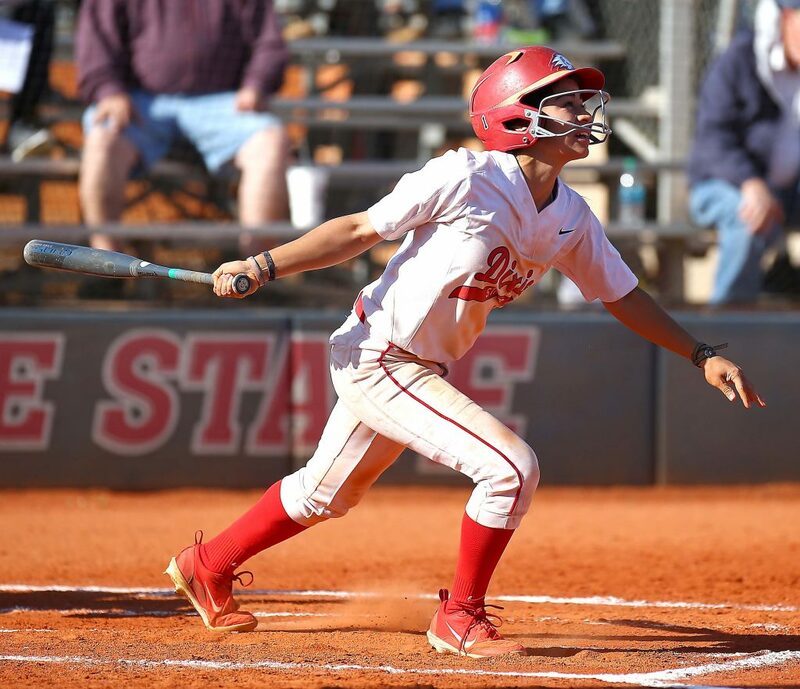 Taylor Godfrey replaced Gahn as a pinch runner and scored when Bartholf belted an RBI-double to left center field. Bartholf scored two batters later when Bassett lined an RBI-triple into the right-center gap to push the score to the final tally of 7-3. Bartholf led DSU at the plate in the game two, finishing with two hits and two RBI. 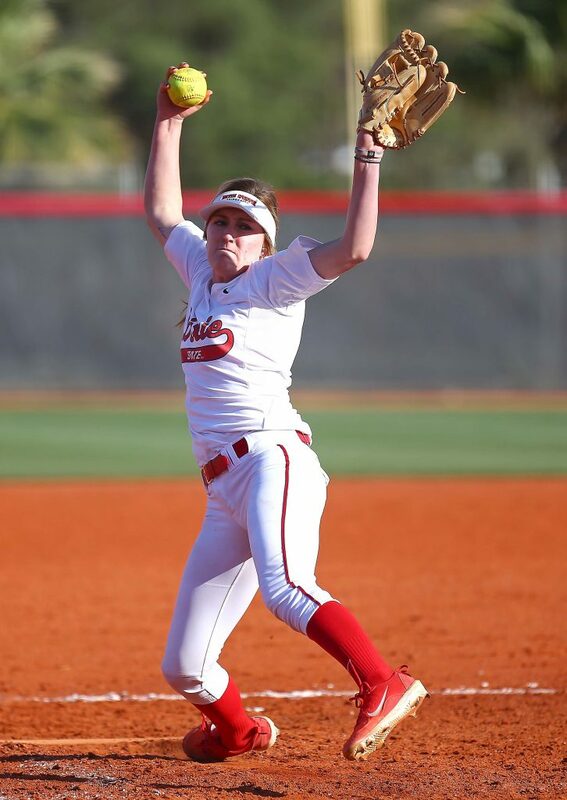 Alexis Barkwell (7-1) suffered her first loss of the season in the pitcher’s circle. Dixie State and California Baptist will wrap up the four-game series with another doubleheader on Saturday at Noon at Karl Brooks Field.